A true delight that "Traveler", the third album from Silver Travis tribute to two missing Steve "Guitar" Harvey, guitarist and composer of Silver Travis' birth of the band in 1981, as well as Stuart Swanlund, emeritus guitarist of The Lightnin 'West Band, Marshall Tucker Band, The Tone Generators, who passed away in 2012. 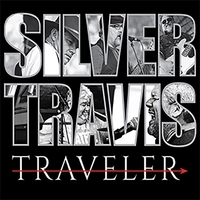 The Silver Travis Band has slightly reshaped its line-up since their first albums "One Monkey Do not Spoil The Show" (2005) and "Take the High Road" (2008): Daniel Jackson (guitar/vocals), and Carey Upton (keyboards/vocals), now support the founding members Randall Calvert (lead guitar/vocals), Joey Parrish (bass), Mike Satterfield (drums), with a thought for their great singer Rick Cash who is no longer of the party. In short, there are damn good songs on this album, entwined in a huge production, work of the two big names the bassist Tim Lawter and the guitarist Rusty Milner, former Marshall Tucker Band. It smokes from the start with the swampy "Spirits In The Hills" of the same tempering musically as Beau Weevils the current band of Charlie Daniels. Following to soften the atmosphere comes "Sweet Carolina" signed Daniel Jackson with the fragrance Marshall Tucker Band. The music then takes a bit of Americana on the tracks "Stop Running" and "Can't Stand The Rain". After, there's some great Southern rock that blows hard with vivid guitars that give their heart to the tracks "You Lie", "Waitin On My Ride" and "Lesson Learned", then the must with "Long Gone ", composition of the late Steve Harvey with Marshall Tucker effects. We continue with Southern boogie on "Baby Blue" with some great slide shots, but the best is waiting for us with "Chain Gang" with Skynyrd riffs in support, which has everything to become a Southern rock standard, sure that it will make the key to the success of the Southern US radios. Already here it is programmed on Sweet Home RBA and Dixie Rock by DJ Luc Brunot, this "Chain Gang" depicts their DIR, ex-DDE/Departmental Direction of the Equipment (the equivalent of the county highways department), but there in South Carolina they are the convicts who get stuck with it under a blazing sun. The magic of this great album ends with the "roots" "Love Fades Away".